The BookMooch Journal Project was started in 2006 by Kenneth Samson. After he learned about the “1000 Journals” project, Ken became intrigued by the concept of traveling art journals and he decided to start a small-scale art journal project for BookMooch participants. The small-scale project now encompasses over 400 traveling journals. The rules are simple: Begin one or more BookMooch-only journals, created out of a hardcover blank journal, a used hardcover book, or a sturdy softcover book, and create a theme and name for your journal. After you’ve made the first art* entry in your journal, set it loose into the BookMooch world. *The journals have now broadened to include text, craft and even mathematical entries in many! Participants can mooch your journal just like any other book listed on BookMooch. Each person that mooches a journal adds their entry, and within two weeks re-posts it into the BookMooch system to be mooched by another member, who adds their entry to the journal and again adds it back to BookMooch for the next moocher (adding to the inventory by its number), and so on. When the journal is completed, it is sent back to its owner. 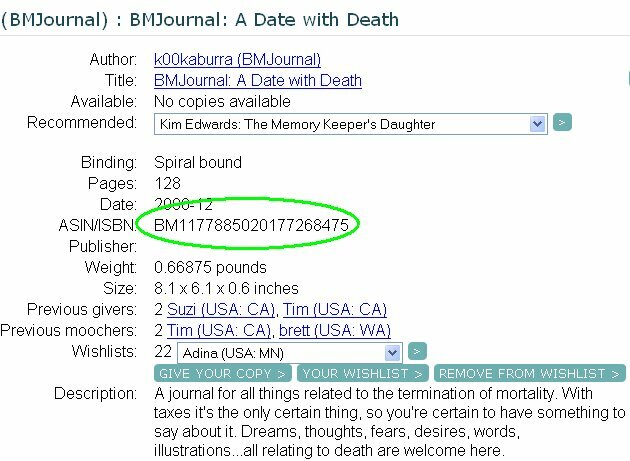 Journals should be relisted by the given ISBN/ASIN number or by going to the list of books you have mooched and clicking GIVE. You can also click on the underlined link in the page shown for that journal here, and that will take you to the journal’s listing on Bookmooch. Check it is the right journal (the last giver should be the person you received it from), where there are several journals with similar themes, and then click to give your copy. Ask the person who requests it if they understand Bookmooch journalling or direct them to look here or at the about page in the journal site. Okay, I want to journal. How do I start? First, you have to be a member of BookMooch to request a journal. A good start is to mooch a journal or two. Get a feel for what the journals are like and what the art is like. Take a look at the list of journals here to see the topics and themes that are being circulated. Each entry here has a link to the journal’s entry on BookMooch where you can mooch a journal or add it to your wishlist. I want to release a new journal. What do I do? 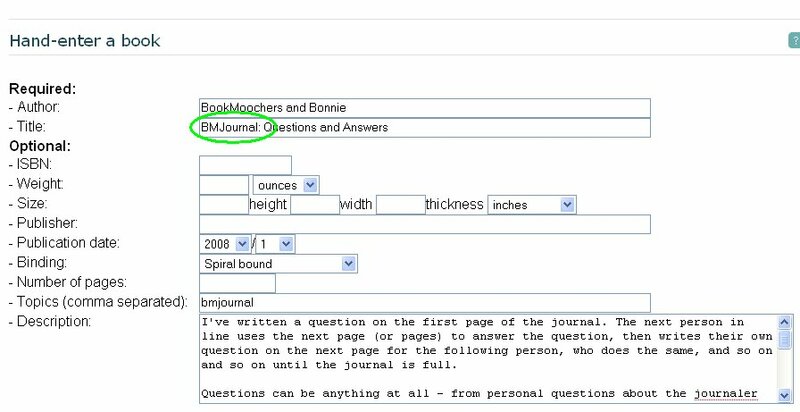 When adding a new journal to the system, make sure to add the word “BMJournal” to the title field along with your journal’s unique name, so others can search for and find the available BookMooch Journals to mooch or add to their wishlists. Please don’t use “BookMooch Journal” as the full title for your journal. Use the description field when adding your journal to the system to explain what you’d like done to the journal. Also, be sure to add your BookMooch ID to the description so participants may contact you. When a journal is ‘full’ it will then be returned to the owner by emailing them for a shipping address. After you submit your entry, jot down the ISBN number. Add it inside the front cover of your journal so participants know how to re-list it. Mention that it is only for recirculation on Bookmooch, not transferrable to other forums. After your listing is completed, have your journal added to this web site by sending an email to bmjournals at gmail dot com. Send a picture or scan of the cover, too. What’s the cost of participating? There is no cost to join or use BookMooch for either regular books or journals. Your only cost is mailing your books to others. Unlike a regular book that you get through BookMooch, when you request and receive a journal, it is not yours to keep. Mooching it is committing yourself to adding your artistic entry into it and releasing it back within two weeks to be mooched again by another participant. The owner of the journal retains ownership and gets it back when the journal is full. The recommended time to keep a journal is not more than two weeks. Please try to adhere to this time line so that the journals can continue to circulate. Real Life does happen and sometimes prevents getting a journal back out within two weeks. If there’s a delay, please be considerate and let the owner know. If you have a big life change coming up, it might not be the best time to mooch a journal! BMJournaler Becky Short started a Yahoo Group with a discussion list for everyone interested in chatting about the BMJournal Project at BookMooch. and post your messages there. All journallers are welcome! The group’s database contains a comprehensive listing of all BookMooch Journals that have been released. Rena Rossner is the BMJournalers Yahoo Group Moderator. For those of you that haven’t heard of, or joined, Flickr yet – come on and join the party. It’s free and all you need to join is a Yahoo account. (Happily, you should all have one already!) If anyone needs any help joining, accessing the page, uploading photos, etc, please ask Clair. Clair Rigby is the Admin for the Flickr Group. what a fascinating concept, am quite intrigued! Really like the new slideshows for the journal entires, what a good idea.